MINNEAPOLIS -- The University of Minnesota football team said it will resume practices and play in the upcoming Holiday Bowl -- ending its boycott of the game and all team activities until the university reinstated 10 players suspended over sexual assault accusations, CBS Minnesota reports. The school declined the players’ request to reinstate the suspended players. Meanwhile on Saturdya night, University of Minnesota students and community members joined together in response to the suspension of 10 Gopher football players, CBS Minnesota reports. They held a rally outside of TCF Bank Stadium, chanting “she is not alone, she is not alone” to show their support for survivors of sexual assault. Organizers also say the rally is an effort to break the silence that surrounds sexual violence. The Holiday Bowl will take place in San Diego on Dec. 27 against Washington State. 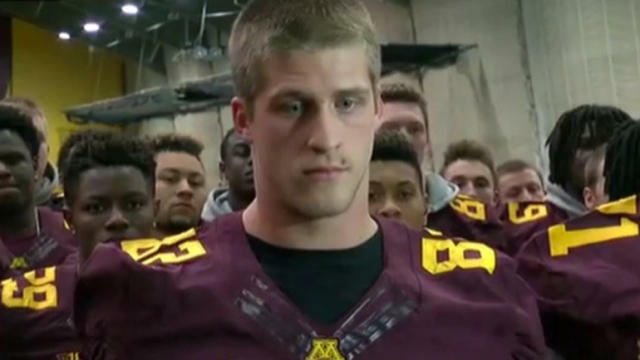 Kaler said on Saturday that teammates were supporting their players, not sexual violence. No charges were filed against the players. The victim filed a restraining order against them. A university investigation included additional players. All 10 were then suspended from the football team. The players’ attorney, Lee Hutton, says he doesn’t understand how, with no new evidence, his clients can be suspended. But the university has stood firm, insisting on a due process hearing next week that would entail a final decision on status.